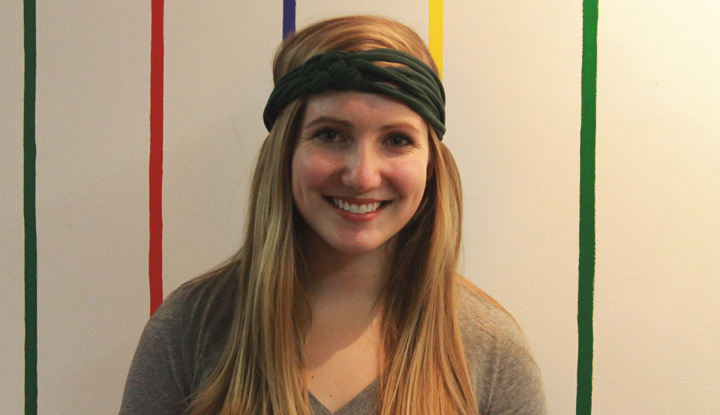 No more lazy hair days with this easy-to-make headband | Grand Central Magazine | Your Campus. Your Story. It’s the time of year when all you want to do is throw your hair into a ponytail or messy bun, but why sacrifice your cute hair for laziness? Making a cute headband is all you need to feel inspired to actually do your hair. Maybe even for your 8 a.m., too. A knotted headband, made out of an old T-shirt, is quick and easy to make. You will need an old T-shirt and a pair of scissors. A glue gun and a button, thread and needle are optional. First, cut off the bottom of the T-shirt, as well as the sleeves and collar. Save the sleeves, this fabric could become useful in a bit. Second, cut out four strips of the shirt from the top to the bottom. The strips should be about one to 1.5 inches thick. Cut these strips at the top where they are still connected so you have a total of eight strips. Pull on the fabric to make the strips longer. 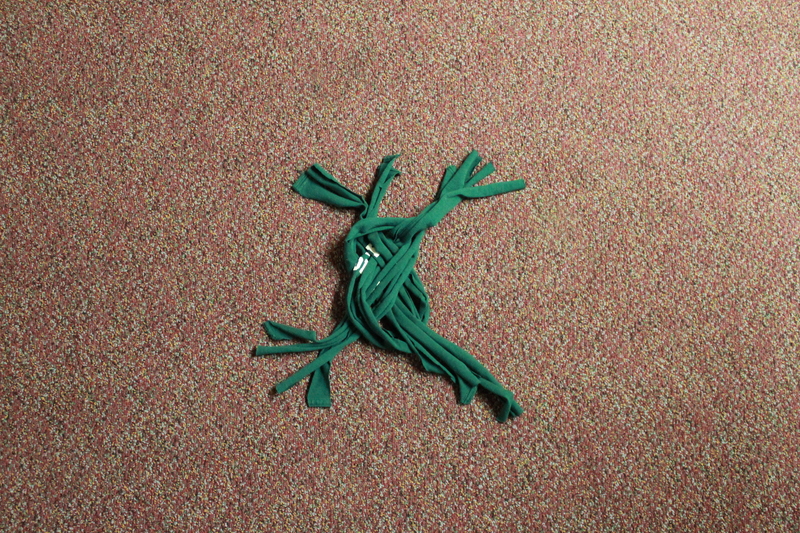 Since they will be knotted and have to go around your head, you want them to be fairly long. Separate the strips into two groups of four. Take one of the groups and make a loop with the right side over the left side. Now take the other group and make a U over the loop. Take the right end of the loop and place it on top of the U shape. 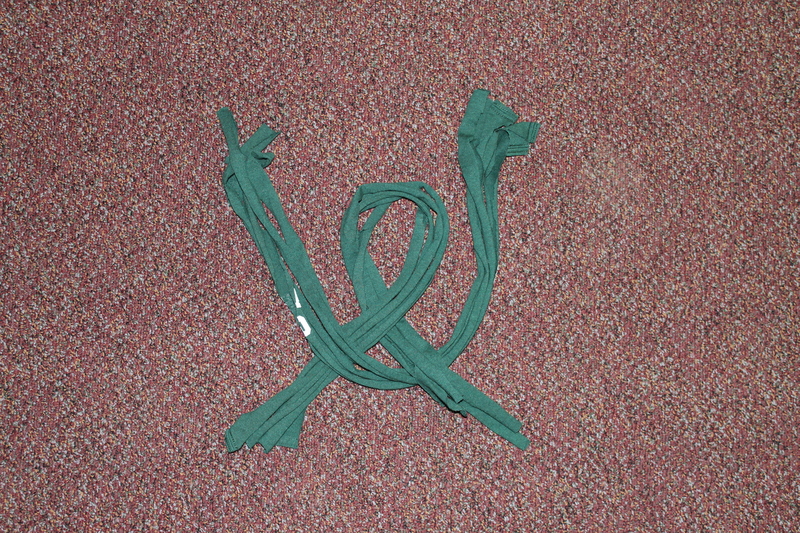 Take the left end of the U shape and place it under the top of the loop. Next take the right end tail of the U shape and put it through the top of the loop, under the left tail of the U shape and back over the loop. From there you should be able to pull the different ends and form a knot. You can place the knot either in the middle of the headband or more on the side, depending on how you want to wear it. 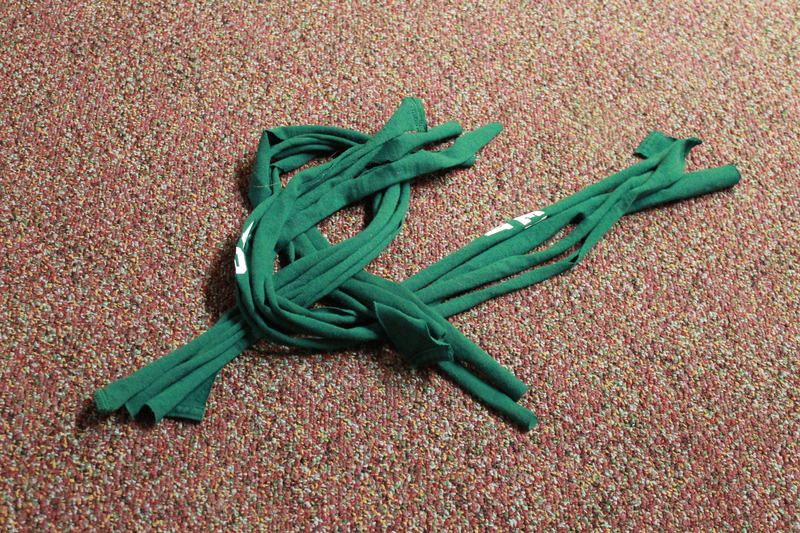 Tie each of the ends to together. Cut a two-inch piece of fabric from any extra piece of the shirt you have (this is where the sleeves might come in handy). You can either tie a knot over the other knots to cover it up, hot-glue it to the fabric or sew it on. To add a little bit of decoration you also can sew a button onto this part. There you have it! A headband that is easy to make and cute to wear. Using a patterned T-shirt makes the headband have a unique pattern and stand out more than a solid color. We all have those tie-dye shirts we wear in the summer, why not spare one for a fun craft on a lazy Saturday afternoon? Separator image Posted in Campus Fashion, Student Styles, Style, Trend and Beauty and tagged with DIY, laura ducharme, t-shirt headbands.